Stunning turquoise engagement ring with a white sapphire set in sterling silver. 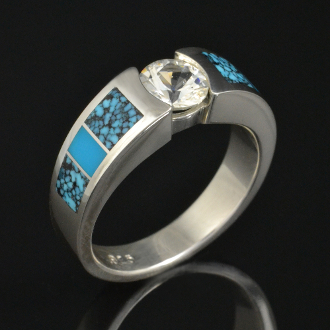 This engagement ring is inlaid with alternating beautiful blue turquoise and spiderweb turquoise. This turquoise engagement ring is 6.2mm wide at the top and tapers slightly down to 4mm at the bottom. The ring has two pieces of Kingman spiderweb turquoise inlaid on each side with a plain blue piece of turquoise in the middle. The center gemstone is a .75 carat round white sapphire which is set almost flush, giving the ring a sleek low profile. This ring is also available with other center stones such as moissanite or blue topaz. The moissanite option will add more sparkle than the white sapphire and is slightly harder. If you would like the Forever One moissanite, just check the box and type "Moissanite please" in the pop up box. If you would like to upgrade to tarnish resistant Continuum silver, check the box next to the upgrade and type "upgrade my silver" in the pop up box. We can also inlay the ring with birdseye turquoise if you are not a fan of the spiderweb turquoise but like a faint pattern rather than plain blue. Check the box and type "birdseye turquoise" in the the pop up box. As shown in the third photo, a matching 4.5mm woman's wedding ring (style W134) is available if you are looking for a matching turquoise bridal set. It is very important that you give us your correct ring size when ordering as it is difficult to adjust the size without using a laser welder and risking damage to the ring. The paper finger sizers you might find on the internet and print out are not accurate. We have experimented and found that they vary from 1/4 to 3/4 of a size in error. Please visit a local jeweler and get your finger sized properly. We depend on you, the customer, to provide us with the correct size so please do not estimate or guess. Special order size rings are NOT RETURNABLE.